Are you wondering what results air quality testing done in your home will produce? Most homeowners are surprised when they discover that the quality of the air in their home is far from perfect despite the fact that they perform complete house cleaning and maintenance. The problem may actually come from the HVAC system and more precisely from the air ducts. 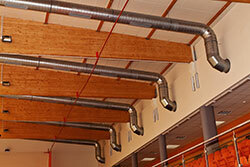 The job of the ductwork is to transfer air from one place to another. When the air moves, it carries all kinds of microscopic small dust and dirt particles. The ones which get transferred to your house get removed through cleaning. There are also ones which are transferred outside. There is a third group, however. These are the particles that get stuck inside the ductwork. They are typically not removed as part of basic air duct maintenance. Just a few dust and dirt particles on the walls of the ductwork will not do much harm, but they tend to accumulate with time. Pollen can also get inside carried by the wind. If moisture creeps into the ductwork mold can grow rapidly. As the air moves into the rooms of your house, dust, dirt pollen and mold particles will certainly get inside and reduce the indoor air quality home. 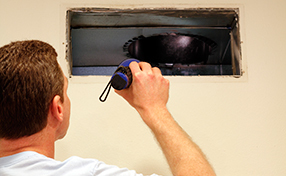 If you need to improve the quality of the air in your home, the experts from air duct cleaning Carson recommend thorough duct sanitization on a regular basis. It should become part of the regular routine maintenance work. It should be paired with home air filter cleaning for best results. In general, filters must be replaced on a frequent basis so that they perform optimally at all times. 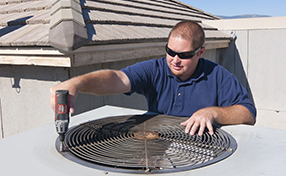 There are other things which you can do for improving the quality of the air in your home in addition to providing better air duct maintenance. You can use a dehumidifier to reduce moisture, air the rooms more frequently and ensure that no one smokes inside the house.